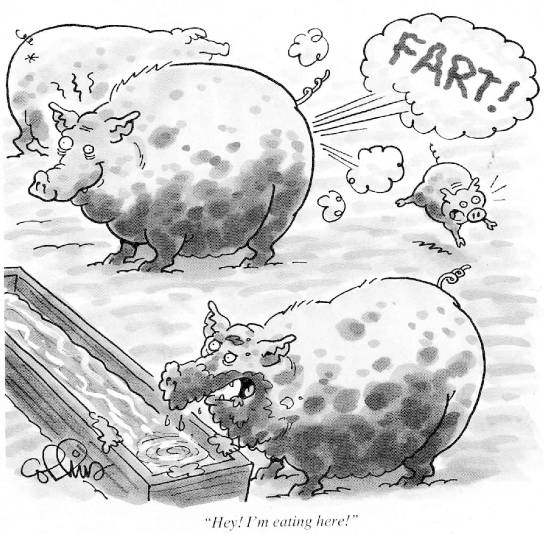 Modern Civilization – A Pig’s Fart? On 26th November 2009, on the 1st anniversary of terrorist attack on the Indian city of Mumbai when whole of India was put on alert, there was another kind of scare on the other side of the globe. A flatulent pig sparked a gas emergency in southern Australia Thursday when a farmer mistook its odours for a leaking pipe. Fifteen firefighters and two trucks rushed to a property at Axedale in central Victoria state after reports of a gas leak. When the firefighters got there, as they drove up the driveway, there was this huge sow, about a 120-odd kilo sow, and it was very obvious where the gas was coming from. “We could not only smell it, but we heard it”, said fire captain Peter Harkins. The pig’s owner was “a little bit embarrassed” and it took fire crews a little while to compose themselves. This is an instance where arrangement is very grand but outcome is nothing. In Sanskrit terminology, this is known as ‘bahvarambhe laghu kriya’. Arambha, beginning is very gorgeous but end is nothing. A high grade arrangement with zero outcome! Sounds like our modern civilization where every thing is decked up but everything, including our very lives, are completely hollow and empty. So much technology, so much advancement, so much ‘progress’! But has it made our lives richer in anyway, has it made us happier than our predecessors in any way, other than threatening the very existence of the world? Like the pig in the story, our civilization is polluting everything, externally the environment and internally the global consciousness. Is our progress simply a high grade arrangement with zero or negative outcome? It needs a bit of ponderance. “In the material world, everything is bahvarambhe laghu kriya. That has been spoken by Canakya Pandita. Aja yuddhe muni sraddhe. Aja yuddhe. Ajah means goats. You have seen goat fighting? As if, though, two big, big heroes are fighting. But as soon as somebody comes: “Hut!” they’ll go away. Have you seen, experienced? Goats and lambs, they’ll fight: (makes sound:) “Onh, onnh.” Like this. But, but as soon somebody comes: “Hut!” So this is one of the example of bahvarambhe laghu kriya. Will our Civilization and all its attendant paraphernalia will prove to be ultimately as trifling and inconsequential as that pig’s farts in Australia?